update: Our Terra/Aquilo Puppies have been adopted. High Caliber Shilohs is thrilled to announce what is sure to be an exceptional litter. 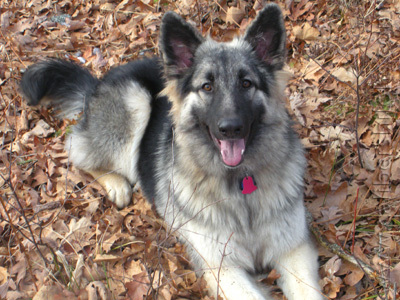 In the spring of 2010, our stunning girl, Terra, will be bred with Adirondack Shilohs' magnificent Aquilo. 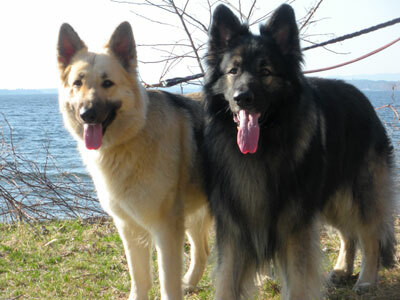 Both are wonderful examples of breed conformation and temperament and their puppies will be considered full Shilohs. Terra is a sweet, athletic girl with lots of substance. She is a great mover with a gorgeous, blocky head and nice ears, thick, soft coat, beautiful saber tail, and good bone with a wide chest and straight front and rear. 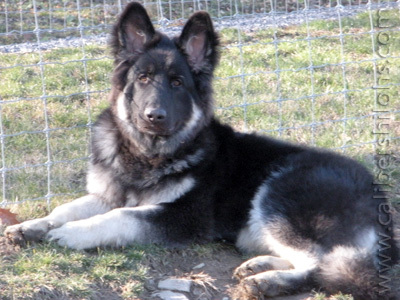 She is a confident girl, but also very friendly and gentle with children, other dogs and small animals. In just over 6 months, she has earned her breed championship and Rarities/NAKC international championship, Canine Good Citizen and Therapy Dog International Certificates, completed beginning and intermediate agility classes, and earned more than half the points needed for her NKC championship. 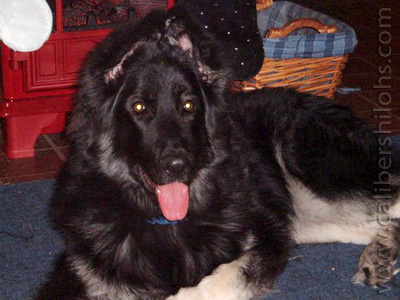 Terra is a practicing therapy dog, and she is very intelligent and willing to please. 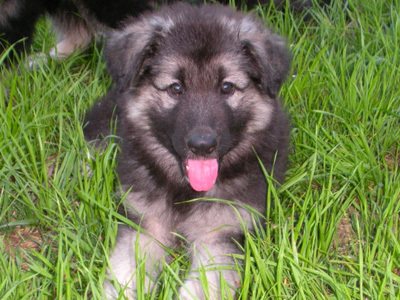 Aquilo is a well balanced, gray sable with a thick, long plush coat. 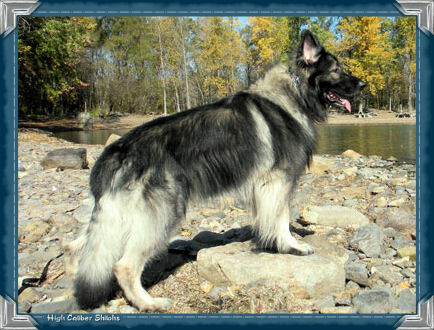 He has a broad head and nice ear-set, perfectly thick saber tail, and possesses effortless movement. He has a classic combination of confidence and intelligence, which is matched only by his clownish personality. He is sporty, preferring Frisbee and challenging hikes. 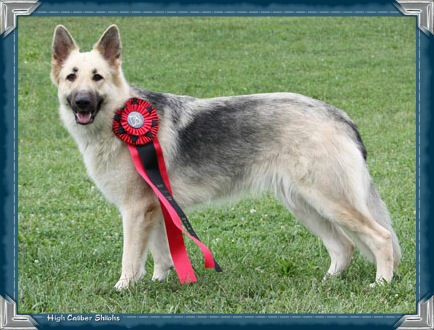 Aquilo is a multiple Best in Show winner, a breed, American, Canadian, and Rarities/NAKC champion. Outside of the ring, he has earned his Canine Good Citizen and Therapy Dog International Certificates, and is a practicing therapy dog. We expect this pairing to produce pups with nice size and substance, beautiful movement, exceptional heads, and great overall balance and conformation. 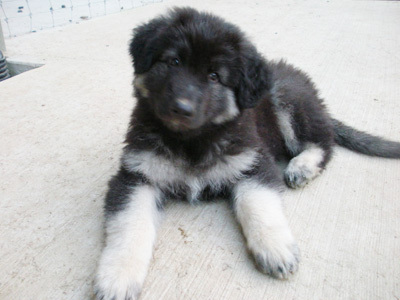 They should be confident and friendly, easily trained with medium to medium-soft temperaments. 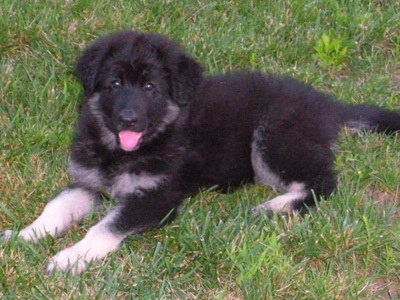 Puppies from this litter will be plush, and we expect good pigment in a range of colors. Website Content Copyright ©2010-2011-2011, Kim Murnyack, High Caliber Shilohs, All rights reserved. Website Design/Programming Copyright ©2010-2011-2011, Creative Office Solutions ~wildeoffice.